Hand crafted using the finest materials, our Kam-Lok™ professional butcher saws have been hand-crafted since 1909 using the finest materials available. We start with high quality stainless steel bar stock, then precision cut, shape and form it into the butcher saw frame. Holes are drilled and the frame is then manually buffed and polished to a reflective finish. 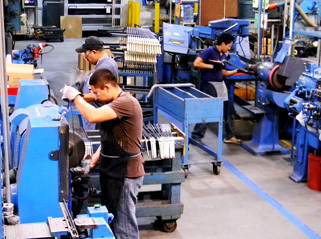 Every Kam-Lok™ lever is individually formed and adjusted before attaching to its frame. The high strength polymer handle is then attached. A quality KASCO blade is then installed and the butcher saw is ready for final inspection, packaging and delivery. Don't settle for less than a Kam-Lok™ butcher's hand saw...the quality standard for more than 100 years! Your hand wraps firmly, comfortably, naturally around the contours of the pistol-grip handle. It's made of non-porous, virtually indestructible plastic that repels meat acids, stains and bacteria. Cleans quickly and easily for a more sanitary operation. You note the precision alignment from grip to tip that makes the most exacting cuts smooth, clean and effortless. With a flip of the wrist you unlock the Kam-Lok™ switch blades and re-lock the lever that always maintains just the right amount of blade tension automatically. KASCO replacement blades for Kam-Lok™ saws are superbly engineered and precision manufactured to assure that they meet the same high standards as the frame. Only the hardest spring tempered steel available is used. Teeth are precision ground for maximum sharpness and the set is controlled to exact tolerances for fast, easy cutting. The thin slot of the frame keeps the blade rigid and stable, insuring straight cuts. 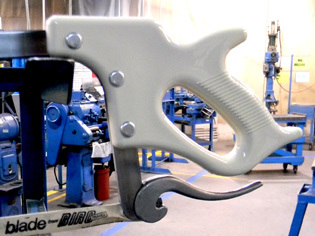 Aluminum and stainless steel Kam-Lok™ handsaws are available in various sizes.